BMW Z4 sDrive20i and 28i review | What Car? 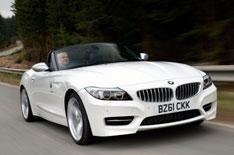 The BMW Z4 has been our favourite roadster since its launch in 2009. With only thirsty six-cylinder petrol engines available, though, it's always taken a battering on the forecourt from Audi's efficient TT Roadster. That could be about to change with the launch of two new turbocharged four-cylinder petrol models. These versions aren't just cheaper to run thanks to a 20% improvement in fuel economy and CO2 emissions they're also cheaper to buy and come with more standard equipment. The 2.0-litre sDrive20i replaces the outgoing 2.5-litre sDrive23i as the entry-level model. With 181bhp, the new engine has slightly less power than the one it replaces, but it also shaves off a few kilos of weight, so there's barely any performance penalty. The 20i can sprint from 0 to 62mph in 6.9 seconds and doesn't run out of puff until it hits 146mph. In fact, because the new turbocharged engine has more low-down torque it pulls strongly from much lower in the rev range, so you don't have to work it as hard to build speed quickly. It doesn't mind being revved, although acceleration does begin to tail off above 5000rpm. It's not all good news. The old six-cylinder model howled like a proper sports car, and while the new four-cylinder unit sounds bassy at low revs and rorty when worked, it isn't that special sort of sound that'll have you prodding the throttle just for fun. The new sDrive28i version of the Z4 uses the same basic 2.0-litre engine, but kicks out a much more muscular 242bhp. Again, that's slightly down on the 30i it replaces, but the new car is hardly slower: 0-62mph takes 5.7 seconds and top speed is electronically restricted to 155mph. The extra 61bhp over the 20i makes the 28i feel seriously quick. There's the slightest of pauses as the turbocharger spins up to speed, followed by a strong surge of power from 1300rpm. It also sounds sweeter than the 20i's engine, and spits and pops between gearchanges and when you back off the power. The Z4 has never handled as brilliantly as a Porsche Boxster, but it's always been agile, with plenty of grip and a reasonably comfortable ride (as long as you steer clear of M Sport versions).That remains the case with these new versions. Our biggest criticism of the car remains as before: the steering just doesn't provide the level of feedback or interaction you'd expect from a sports car. Not much has changed inside, but then not much needed to. The Z4's class-leading cabin is beautifully crafted from top-quality materials, and everything important is clearly labelled and within reach. BMW's iDrive system (part of the £2225 Navigation package fitted to our test cars) is one of the best infotainment set-ups available in any car, with intuitive controls and a user-friendly menu system. The only area that has been improved is the Z4's standard specification. Despite being £945 cheaper than the outgoing model, the new sDrive20i adds leather seats, Bluetooth, a USB socket and automatic lights and wipers to the kit list. The sDrive28i adds Bluetooth and a USB socket to the spec of the sDrive30i and costs £1015 less. If you're in the market for a small, premium-branded roadster then the Z4 is more appealing than ever. It's not only a lot more efficient than before, it's also cheaper to buy and better equipped. The Porsche Boxster remains the class benchmark for performance and handling, but throw everything else into the equation and the BMW has it beaten. The question is, which version of the Z4 should you choose? In the past we've always recommended sticking with the entry-level model, but that's no longer such a straightforward decision for two reasons: the extra power now comes at a lower price, and the new 28i engine suits the Z4 better than the old six-cylinder 30i. Both new versions also have exactly the same 41.5mpg and 159g/km CO2 emissions only slightly worse than the figures of an Audi TT Roadster 2.0 TFSI. Overall, we (just) prefer the sDrive20i, simply because the 28i pushes the price a little too close to Porsche Boxster territory. However, whichever engine you choose, we'd strongly recommend going for the standard (not M Sport) version because of its better suspension set-up.